Located on the Coral Coast in Viti Levu, Shangri-La Fijian Resort and Spa is set on the private Yanuca Island boasting 109 acres. It is the only resort on the Coral Coast to have natural golden sand beaches, plus the beautiful blue lagoon right at its doorstep. 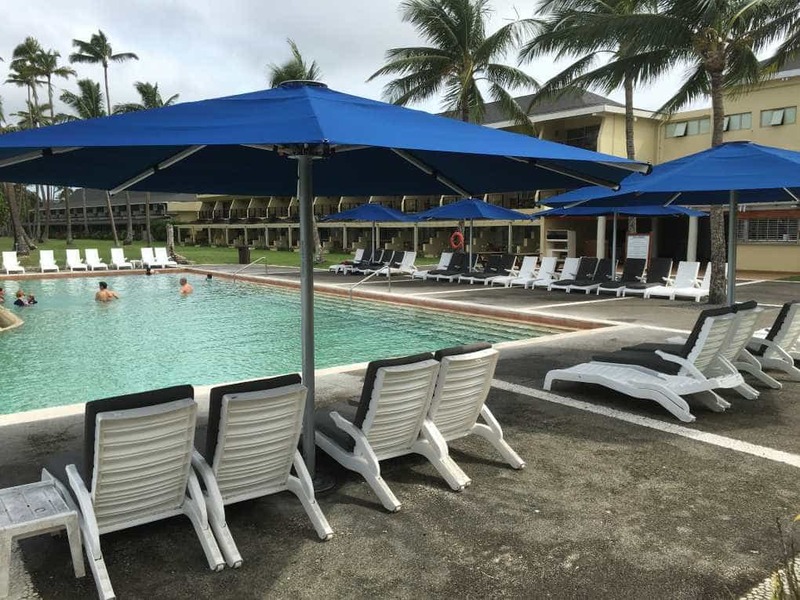 As part of their ongoing upgrading and maintenance of the resort, they recently sought out some commercial umbrellas from Auckland based company Shade7. Shangri-La Fijian Resort and Spa required a number of large umbrellas to be scattered around their various swimming pools to offer their guests protection from the sun and light rain. The commercial umbrellas needed to be fixed to the ground, with the strength and ability to withstand some of the stronger sea breezes that the resort can be exposed to. Shade7, a New Zealand owned company operating in Auckland suggested the installation of several of their heavy-duty Tempest commercial outdoor umbrellas. The Tempest commercial umbrella has been designed to tolerate wind gusts of up to 80-100km/h while open, which makes it the perfect candidate for Shangri-La’s requirements. The umbrella has been built with a sturdy 94mm reinforced aluminium mast with internal reinforcing channels for additional strength. Shangri-La Fiji selected Shade7’s premium marine-grade acrylic canvas canopy in Navy Blue, which is water repellent, has the highest colour fastness rating available, plus the highest UV protection rating possible, UPF80. Managing Director of Shade7, Michael Pearce, says that the resort are very happy with their new umbrellas and that guests of this resort have already been making great use of them. Shade7’s Tempest, Monaco, Riviera and Fibreglass outdoor umbrellas are among the most popular commercial umbrellas for resorts, cafes and other commercial environments. For more information on commercial outdoor umbrellas or to discuss your requirements please contact Shade7.